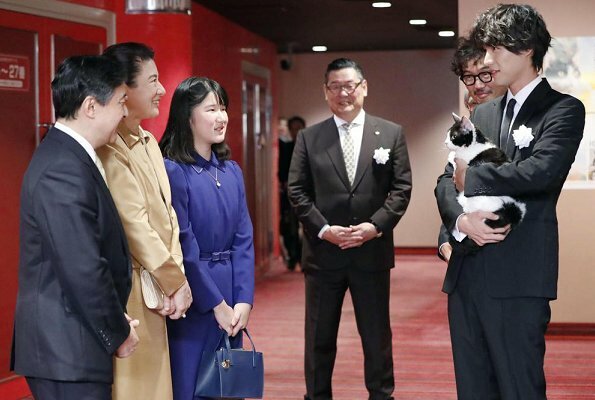 On October 15, 2018, Crown Prince Naruhito, Princess Masako and Princess Aiko attended a charity screening of "The Travelling Cat Chronicles" shown at the Toho Cinema in Yurakucho. 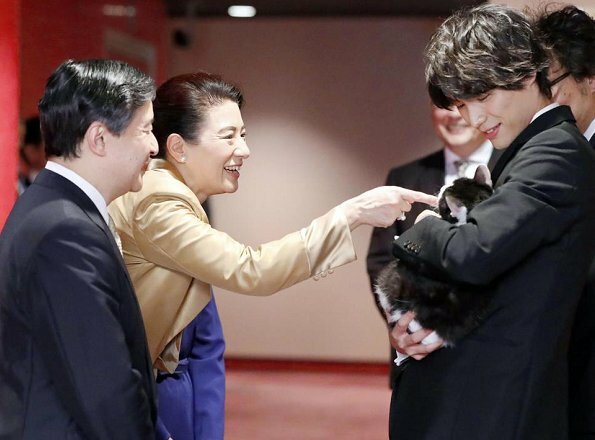 Crown Prince Naruhito, Crown Princess Masako and Princess Aiko met with the film crew. The movie is based on a novel by Hiro Arikawa. Satoru and his pet cat Nana travel together in search of Nana's new owner. Very nice to see the Imperial CP Family again. CP Masako seems really happy that is very nice to see. Pss Aiko has grown a lot. Do like both coats, nice colors. Sweet scene with a close family and an adorable kitty cat! The deep violet blue color is lovely on Aiko. Princess Aiko becomes a beautiful young lady.